Obituary for Robert N. Bump | Fox Funeral Home, Inc.
Robert N. Bump, 86, of Cabot passed away on October 24, 2018 at Concordia of Fox Chapel. Born May 29, 1932 in Sarah Furnace, PA, he was the son of William H. Bump and Helen Parker Bump. 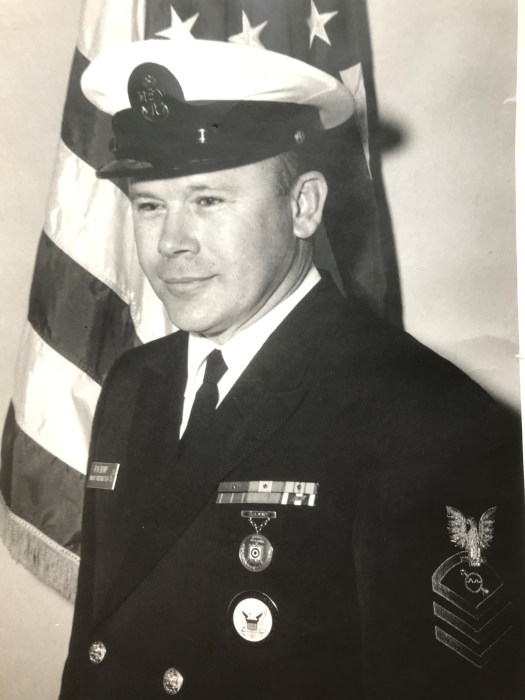 Bob served in the US Navy retiring after 20 years as a Chief Petty Officer having served during the Korean and Vietnam wars. He received a Bronze Star for meritorious service as an Air Intercept Controller in Vietnam. He had an illustrious Navy career. In the 1960's he earned a spot on the Navy Rifle and Pistol Shooting Team. In the early 70's, due to his expert marksmanship, he volunteered and was accepted into the Sky Marshall program to protect the flying public. He also served as the Postmaster of Cabot from 1978-1990. He was a member of Saxonburg American Legion Post #683, Saxonburg VFW Post #7376. He was an avid outdoorsman and enjoyed gardening. Surviving are his wife, Lillian R. "Tootie" Rausch Bump, whom he married February 15, 1992, his children, Joe (Karen) Bump of Burke, VA, Doris (Dave) Williams of Verona, Denise (Jeff) Hoover of Naperville, IL and Tina (Jim) Pezzone of New Castle, his step-children Gregory M. Black of Freehold, NJ, Pamela M. Rodgers of McCandless Twp. and Jill (Pat) Sarnese of Butler, 15 grandchildren, 6 great-grandchildren, 2 sisters, Donna (Frank) Tascarella of Petrolia, Carolyn Conklin of Middleburg, FL and 1 brother, Dennis (Flo) Bump of Chicora and his life-long friend and brother-in-law Louie Pacy of Sarah Furnace. He is preceded in death by his parents, his loving wife, of 34 years, Rose Pacy Bump, one son, Kenny Bump and 7 siblings. There will be no visitation. Private services were held. Interment will follow in St. Esubius Cemetery, East Brady. Memorial donations may be made to the Alzheimer's Association.